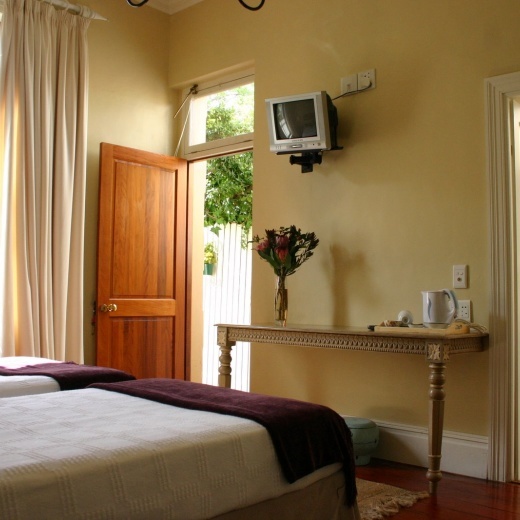 The guest house is situated within walking distance of the City Centre - Via the tree lined Avenue through the Historical Government Gardens. Within minutes you can enjoy a walk in the De Waal Park. For your evening meal you have the choice of more than 20 restaurants and a few cosy pubs within a few minutes-walking- of our home - varying from traditional foods to Thai food. A number of Deli’s are also close by. You could place an order with "Mr Delivery" who will deliver a meal. Table Mountain is just up the road, there is an easy walk up Lion's Head. - With its ever-changing views of Cape Town. The Waterfront, Clifton/Camps Bay beaches are a few minutes away by car. The Wine lands of Paarl, Franschhoek (little Switzerland) and Stellenbosch are about 45 minutes by car. Enjoy your Continental Breakfast served on the porch or under the Gazebo or in the Winter when its raining round the old yellow wood table in the Dining Room.